Mahesh Basnet, Ministry of Industry, Nepal at the launching of the Design Manual for Improved Fixed Chimney Zig-Zag Brick Kilns in Kathmandu. The destruction of brick kilns caused by the massive earthquake earlier this April damaged approximately 110 chimneys in the valley. Although unfortunate, their reconstruction is being seen as an opportunity for the introduction of more sound brick kiln designs through timely development and publication of new design manuals. The designs promote cleaner kilns that will reduce harmful air pollutant emissions and improve fuel efficiency. ‘Design Manual for Improved Fixed Chimney Zig-Zag Brick Kilns’ was prepared with input from local brick experts, entrepreneurs, national engineers, scientists, and architects, and external reviews from international experts. It is the first of its kind in South Asia. 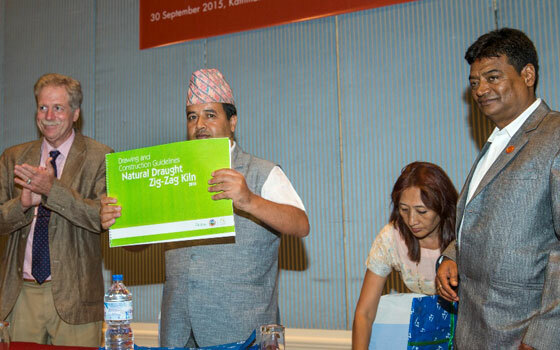 It was released by Mahesh Basnet, Ministry of Industry, at a gathering of government officials, development agencies, and brick entrepreneurs from the Kathmandu Valley on 30 September 2015 in Kathmandu. After launching the manual, Basnet, said he the better design and modern technologies were positive and urged the Ministry of Industry to seek a key role in the modernisation of the kilns. David Molden, Director General of the International Centre of Integrated Mountain Development (ICIMOD) shared his enthusiasm for the new design’s potential. The launch of the manual is a joint effort of the Atmosphere Initiative of ICIMOD, Federation of Nepal Brick Industries (FNBI), and MinErgy to support the construction of improved brick kilns in Nepal. The manual is a practical tool to guide brick entrepreneurs in rebuilding their kilns. It includes engineered designs and two supplementary documents that provide drawings and construction guidelines. It is expected to serve as a guide for construction engineers and supervisors to delineate essential parameters for the construction of both induced and natural draft zig-zag kilns. However, there are unique features for most brick kilns and kiln sites, and a single design recommendation may not be appropriate in all settings. The proposed design has been developed for particular conditions, as described under the respective headings, recognising the inherent variability that exists in Nepal.